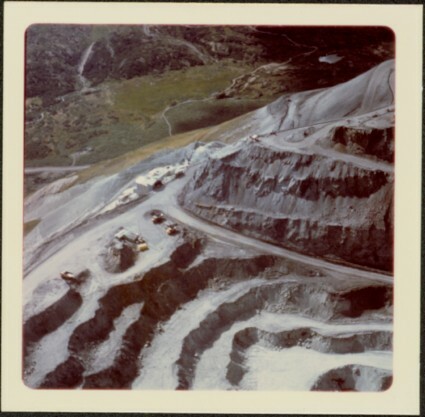 Photograph depicts a portion of the pit in foreground at the Cassiar mine. Crushing plant visible in centre below base of West peak. Footwall road in midground, mine valley in background. Building near trucks at top of pit was called the "shifter shack," where crews were relieved or dropped off for work. Item is part of the Cassiar Asbestos Corporation Ltd. fonds. Image is one of five photographs believed to have been taken together, see also items 2000.1.1.3.13.56 - 2000.1.1.3.13.59.